review The Summer Tree, the first book by Canadian author Guy Gavriel Kay, is a delightful little gem of fantasy literature that promises big things for the other two books that round out The Fionavar Tapestry trilogy. Readers who love Ursula K. Le Guin’s deceptively simple style — which surprises due to the complexity of meaning and expression of human emotions beneath the surface — will find much to like in Kay’s prose. Rarely have I read a novel which packs so much character and plot development and world-building into its pages with so little wasted exposition. The Summer Tree embodies the phrase “small, but perfectly formed”. 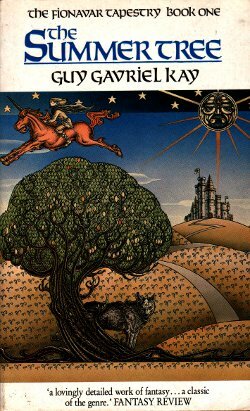 The book, first published back in 1984, was Kay’s first venture as a novelist under his own steam, although he had previously worked with Christopher Tolkien to assist in the editing of The Silmarillion, a collection of unpublished work by his father, the fantasy master J. R. R. Tolkien. It chronicles the journeys of five Canadian university students who are drawn into another world after attending a lecture by the reclusive Professor Lorenzo Marcus. Marcus, it turns out, is in fact Loren Silvercloak, a mage from Fionavar, first of all the worlds, and he needs five adventurers from another world to spend a few days in his own to celebrate the 50th year of the rein of High King Ailell of the country Brennin. Of course, playing tourist for a few days on another world where dealing with gods, magic and bitchy priestesses who think they’re top dog is all in a day’s work doesn’t prove that easy … but then what kind of plot would it be if our five protagonists just had a few days off in sunny Fionavar before calmly heading back in time for end of term exams? As expected, things go pear-shaped in the first of all the worlds, and the University of Toronto five find themselves playing star roles in the pending apocalypse led by the big bad, the ominously named Rakoth Maugrim. Much in the The Summer Tree could have been dragged straight from Tolkien or any other stereotypical fantasy epic. You’ve got the inevitable Dark Lord and his twisted minions, mysterious and well-aged sorcerors, elves, dwarves, a dying king and his squabbling prince children, and of course, the voyagers from another land. But the book doesn’t feel like a stock treatment of such tropes. Instead, Kay wisely recognises that it’s our past experiences and our existing characters that will shape the future. He lets his characters naturally guide the story, rather than trying to force plot development artificially. Thus, one character’s guilt over the death of a loved one becomes the motivation to sacrifice themselves for the greater good. Thus, a reticent, almost societal outcast from one world finds companionship and understanding with a similar character from another. “Real human emotion and insight” might be Kay’s watchword with The Fionavar Tapestry. Having said that, the plot in The Summer Tree is fascinating; filled with events that will uplift, inspire, or traumatise you, either way. Kay’s writing shares with that of Le Guin an ability to touch and embrace the tragic comedy that forms human endeavour, with all of its bathos, while not either grasping and focusing on it too tightly, or denying or judging it. Such writers simply facilitate a situation where the reader can accept the contradictions inherent in life. You’ll likely find shadows of your own toils and worries in those of Kay’s characters. The triumphs and lusts of young adulthood, tso far distant from the games of being a teenager. Everything is for keeps when you’re out from under your parent’s wings. Every action has a consequence. This wise insight, matched with a Tolkienesque fantasy world, with all of its glory and despair, makes for a heady mix, and one I won’t forget any time soon. If you’re a fantasy fan, make plenty of room on your shelf under “K”. This is one author who should be watched closely.